I was going through some old pictures this week and came across a lot of pictures of my grandfather. My grandfather was in a ton of movies and I thought I would put a few pictures out here. 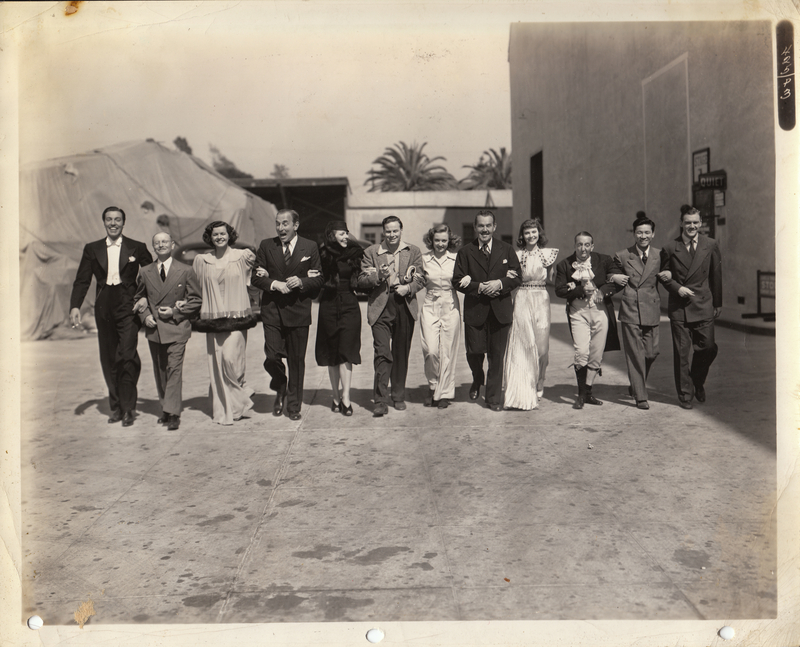 Below is a picture of the cast from the movie “Charlie Chan at Treasure Island”. In the picture are Cesar Romero (on the far left), and the cast of the movie. My grandfather, Wally Vernon, is third from the right. Wally Vernon in "Charlie Chan at Treasure Island"
Here is my grandfather in “Happy Landing”. He’s in the middle. 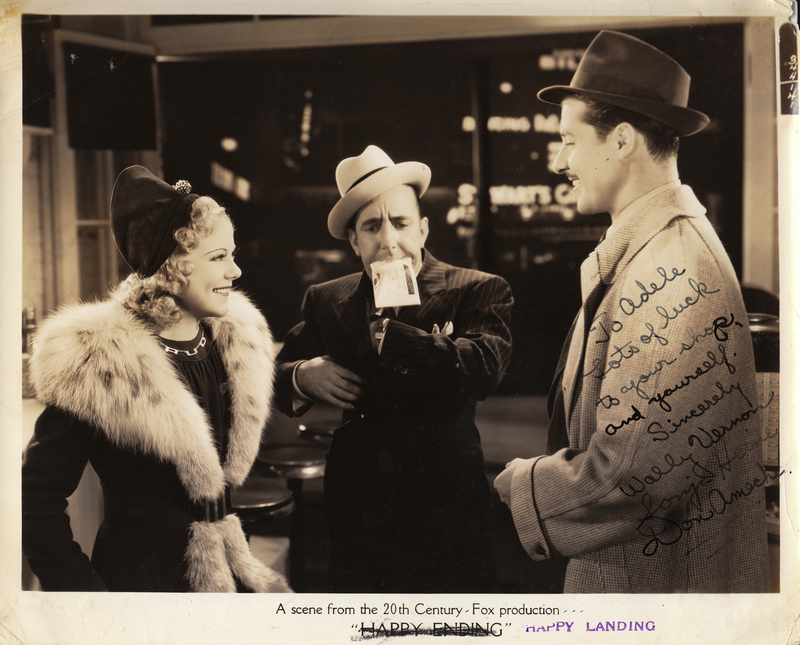 Wally Vernon in "Happy Landing"
My grandfather was killed by a hit and run driver while crossing the street. Here is the info on his death. He was a wonderful man. Bob…great to hear from you! I would love to have copies of pics with Wally. Just let me know the best way to make that happen. I served with the 1st Marine Division in Korea from 1951 to 1953. I was fortunate to have been able to attend USO show featuring Frances Langford, Jon Hall, Margaret Brown, and Wally Vernon. I have a couple of pics from that USO show. Obviously I’m 89yrs old now but would be happy to provide a copy of those pictures if you would like. I will say he – and his group – brought a great deal of joy to us at a very stressful time in our lives. I would love to see the picture. If you can scan and upload it feel free to do so! Thanks. Going through things from my Grandfather and came across a head shot of Mr Vernon dated 1/5/32. Hit Goggle to find out who he was, all very cool. Hi, this is Ingo from Germany! I dont know WALLY VERNON before. But this Morning i took a look through the Dvd from I SHOT BILLY THE KID and i was impressed what a famous Actor he was! I google his name and find this site! I am very glad to see some other pics from him! Best Ingo. Vinny…thanks for the comment. It’s great to hear from someone who knew Wally. I was a young truck driver in the early 50’s when I met Wally Vernon.He was grooming a dog in the rear of a coffee shop in Carteret,NJ. He was very gracious and took time to talk to me. I just watched him in an old movie on TV and Googled him. That meeting was 80yrs ago and I never forgot it. Hi Bob, there are a lot of interesting stories from these fans that I’d like to talk about with you. Please email me so we can exchange our contact information. Thanks! Yes, I saw that – it was Shemp! I watched far too much of the Three Stooges than was good for me back in the 50s and 60s!! :o) Wally’s delivery and pratfalls (not to mention his NY accent) in several places in those 2 films were exactly like those of the Stooges. Great stuff. Funny you mention the three stooges. At one point Wally opened a business with one of the stooges. Thanks for your comment! I had never heard of Wally Vernon until I saw 2 movies he did with Allan “Rocky” Lane in the 1940s, “Stagecoach to Monterey” and “Silver City Kid.” He was clearly a wonderful actor and his humor and performance reminded me very much of the Three Stooges, great physical comedy and machine-gun-fast verbal comedy as well! Your Grandfather had parents, they were my great grandparents. Your grandfather had a sister, Ethel Webb, she was my Grandma. He had nephews, one was his first nephew, my Dad, John H. Longe. Your grandpa was known as Uncle Wally and often came to our family reunions held each year. Your Grandpa’s parents were known as the Original Vaudeville act Maggie and Jigs. He and his sister performed also, she was known as little baby Ethel. They were great tap dancers. I have a treasure trove of pics of the New York marquees showing Maggie n Jigs name, I have the declaration of intent from your grandparents when the left England and settled into NYC. A picture from James Cagney stating how Wally always stole the show. Wally used to own a bar with Shemp from the Three Stooges in Los Angeles too. So much history, I’d love to see your pics some time. I knew Wally for many years.He called me once from Florida,and said he was”busted” could I send him $200 to get back to L.A. for a picture. I did and never heard from him again. A REAL phony!! I came across your site while doing some research into my family’s genealogy. My great-grandfather (James Webb) was an orphan from London England who eventually settled in Toronto, Canada in the late 1800’s. 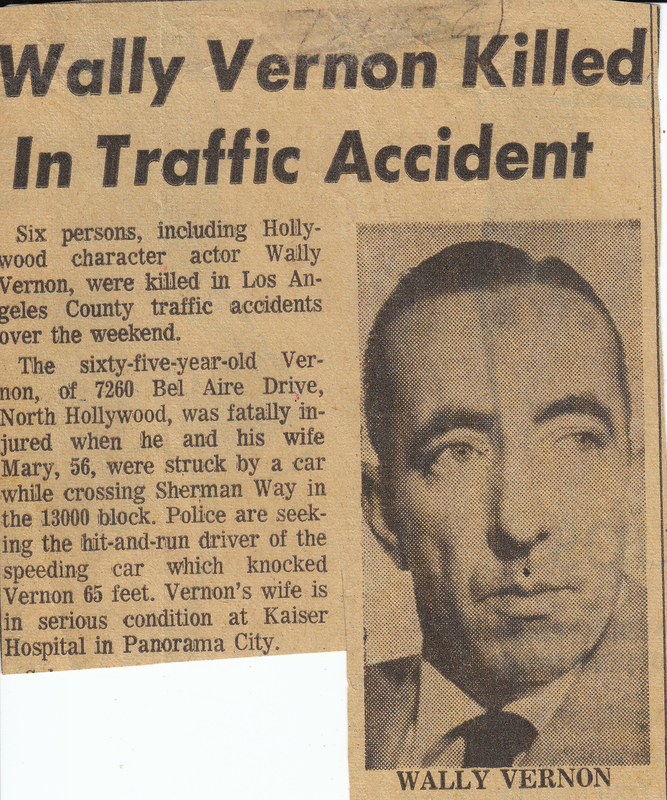 Before he died my father related a story that Wally Vernon was his cousin. My great-grandfather had a brother named Walter who emigrated to the States (don’t know where) and was living in Florida in the 1950’s. According to my dad, Walter (Webb) was the original Jiggs of Maggie and Jiggs fame and was Wally Vernon’s father. Do you happen to have any details of your grandfather’s background that might corroborate this story? John…I would love to talk more about this. Can you email me at rmyers@okwu.edu? We can exchange contact info. Thanks! If you’re not sitting down, please do. I’m sitting with my mother, ihe older twin of Wally Vernon and Ann Lambert. (They were born on 7-18-26). I enjoyed the videos of our grandfather, and wonder who you are. My mother, aunt, and I would like to share some stories with you. We are astonished to find an ongoing family and fan club. I always loved anything Wally Vernon did. I love his “This is the Life number from Alexander’s Ragtime Band. I leaned the lyrics and taught them to a couple of my grandchidren when they were toddlers When they sang it back, I usually got comments from my wife and daughter about what I had been teaching their children. Wally was, and still is one of the very best. Taught in vaudiville. We dont have entertainers like that anymore. Don in Massachusetts. got you quite by accident, was looking fior another wally and the name wally vernon came up, which set me wondering was it the same guy who used to partner eddie quillan in the comedy shorts we as kids in liverpool used to watch at the saturday matinee in the 50s……this was all i knew ….wally vernon and eddie quillan in……….whatever. i had no idea that he was such a consummate entertainer, couldnt get anything from alexanders ragtime band but found the footage of the hillbilly soft-shoe and was knocked -out! I’m not sure what order you mean but if you want to download any of the pictures, just right click on the picture and save it. You’re welcome to any of them. Have you got to employ a credit card to place the order? Larry…thanks so much for this. If you have any stories you can share about him feel free to do that. Feel free to post on the blog or send to me privately at rmyers@okwu.edu. Thanks again! In 1968/1969 I delivered perscriptions from Canyon Square Pharmacy to your Grandfather on a regular basis. Whenever I went there I knew an excuse for time on the road would be necessary. Your Grandfather always intrigued me with his captivating experiences. So many adventures with stories to match. I was honered to know your Grandfather. I also met wife Mary who was very loving. I went to UCN in 1970 and didn’t hear of his Death. A terrible end for a man that followed his dream. Wally Vernon does a great dance number in Alexanders Ragtime Band, I enjoy watching it over and over again. thanks. Arthur…thanks so much for your note. I sure miss him. I had a lot of fun with him as a kid. Keep in touch. Your grandfather was a tremendously gifted entertainer: fantastic dancerand very funny guy–as the adlibbing in the clip from quare Dance Jubilee testifies. His resemblance to Alan Jenks (he’s in another Alice Faye picture, Tin Pan Alley) was enough to make me wonder whether it was WV I was seeing–until I saw the credits at film’s end. But then, could Jenks dance? Do cartwheels? I watch Alexander’s Rag Time Band for all its fun, but quite frankly, what I most look forward to and enjoy is your grandfather’s two numbers. A New Yorker myself, I hear the sound of the Big Apple in every syllable of Wally’s spoken lines. I reflect on his background–in vaudeville, as a very young performer? I had two great-aunts who began that way in New York–at the then-respectable Coney Island–just a bit before your grandfather. One of them went on to silent film and was mother of actress Ann Dvorak. What a time, what an era! And Wally Vernon still strutting his stuff for the pleasure of all of us. It’s wonderful. It’s funny, usually it’s the relatives that get-a-hold of me 1st when they see a clip of mine. .. Thanks so much for this! If you have any more material please let me know. I sure appreciate it. I just uploaded a clip of your grandfather doing a bit of soft-shoe shtick. I remember him in many, many roles over the years. Enjoy the clip!